This simple salad has been one of my favorites of the year. It requires you to step away from the pre-washed bagged lettuce, but I think Romaine hearts are one of the easiest lettuces to prepare. If you can chop and wash celery, romaine hearts work the exact same way. Adding sliced grilled chicken can quickly turn this salad to an entree, but on it’s own it makes a wonderful side dish for anything from spaghetti to fish and nearly anything in between. I’m probably going to have to break down and get a salad spinner this year and maybe even a toaster. After completely exhausting myself last year hand making nearly everything from scratch, I’m looking for ways to bring back the KISS (keep it simple, stupid) plan to at least some of our meals. When I make toast for my kids or husband I burn approximately six slices for every one that’s edible. I know you *can* make toast in the oven, but apparently that’s not my strong suit. Homemade croutons from a stale baguette are sooooo much better, but a box will do in a pinch. Rinse romaine leaves and gently pat dry. Chop into 1-inch segments. Peel cucumbers, then halve lengthwise and slice into 1/2 inch segments. Gently sprinkle cucumbers with sea salt and pepper. Use vegetable peeler to shave slivers of parmesan cheese into Romaine lettuce. 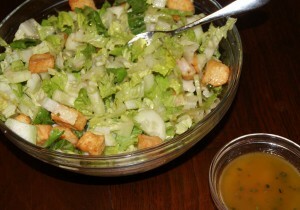 Sprinkle with croutons, then add the seasoned cucumbers. Top with vinaigrette and toss with tongs. Combine all ingredients, then whisk with a fork to combine. Serve immediately after stirring. I appreciate the effort that goes into your approach to cooking – slow food. Food tastes better when prepared with love and attention to detail. However, you should not feel guilty about getting a toaster. My grandmother made me make toast the old fashioned way whenever there was a family breakfast. By the time everyone had toast my meal was usually pretty cold. Thanks Elle! No more guilt on the toaster, I’m just going to jump right in!